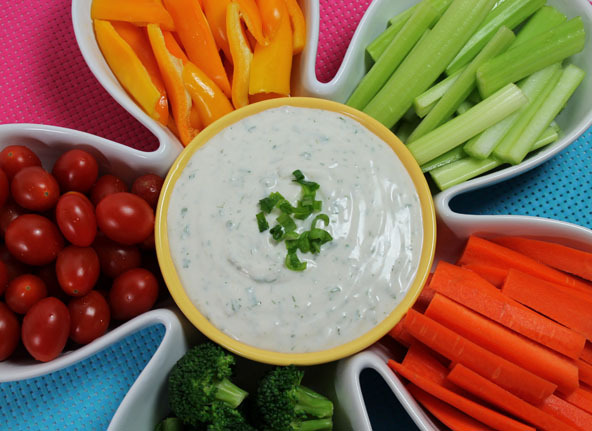 By replacing this recipe for store bought Ranch Dressing you can eliminate refined soybean oil, sugar, phosphoric acid, xanthan gum, modified food starch, artificial flavor, disodium phosphate, sorbic acid and calcium disodium EDTA as preservatives. One of the ingredients for this recipe is Vegenaise found at your local health food store. It is a healthy mayo alternative made from expeller-pressed grapeseed oil or safflower oil. 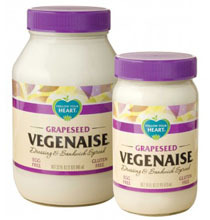 Vegenaise is Vegan, gluten-free, dairy-free and non-gmo. I kid you not, it tastes great. Ranch dressing never tasted so good. I must admit that the Brown Rice Syrup and Soy Protein are not ideal ingredients but it’s a major upgrade from the bottled alternatives. Just compare ingredients! You may want to use this recipe with Vegenaise as a convenience as you transition your family towards eating more and more pure whole foods. 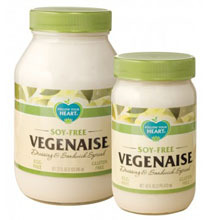 I started with the Grapeseed Oil Vegenaise but have since switched to the Soy-Free. Another recipe using Vegenaise in is Karly’s Two Ingredient House Dressing. 3-4 Tbsp of water or nut milk to thin it out to a dressing consistency. Combine all ingredients in a bowl and mix together well with a spoon, fork or small whisk. Store in a glass jar with a lid and keep chilled until ready to use. It is best to make it at least an hour before using so the seasonings have time to meld nicely together.